This simple yet stunning shower head is manufactured to the highest standards and constructed from solid brass. 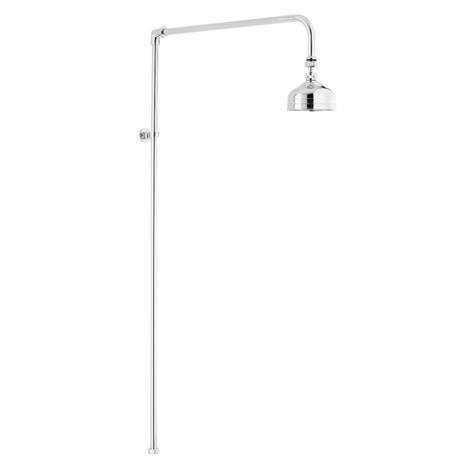 The Chrome Rigid Riser Shower Kit comprises exposed pipework with a 4" shower rose on an adjustable ball joint. Combined with an exposed shower valve (sold separately) this rigid riser shower kit enhances the appearance of any bathroom. Q. Is this shower compatible with a 1/2 inch connection? Hi Louise, Xtra pumps are supplied with anti-vibration couplers and isolating valves on the inlet couplers. Hope this helps, thanks. 0 out of 3 found this question helpful. Q. Is the main shower head fixed or moveable? Thanks in advance for your help! This Traditional Rigid Riser Kit has a head which has a ball joint fitting allowing it to move. Yes, You will be able to cut the pipe on this rigid riser kit to size.